500 Kenyan refugee children learn to solar cook! On April 29, 2017, a Solar Cooker Festival for 500 schoolchildren was held at Kakuma Refugee Camp in Kenya. 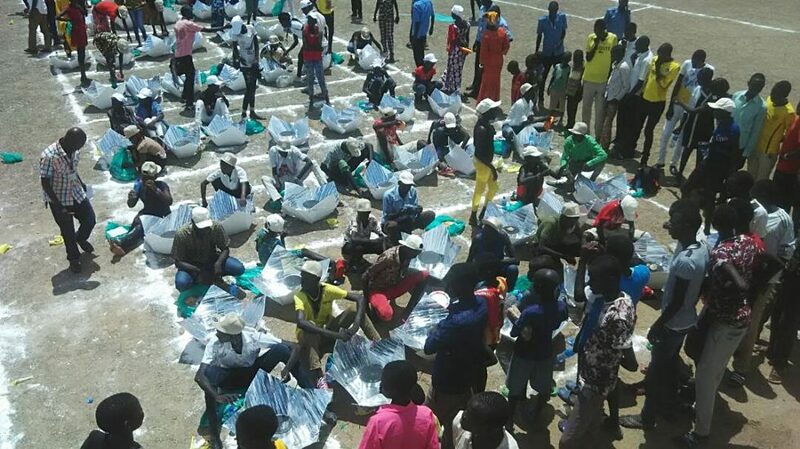 This celebration not only made solar cooking possible for 500 households, but was the inception of a sustainable solar cooker social enterprise to meet the high demand for solar cookers in Kakuma camp. A 2016 study by World Food Program engineer Godfrey Mawira showed that solar cooking was the second-most preferred method of cooking in Kakuma, even though very few solar cookers were available. Inexpensive, durable solar panel cookers called “Haines-Copenhagen” cookers were assembled in Kakuma by refugees from materials donated by Haines Solar Cookers. They should last 10 years with proper care. Training was provided by Faustine “Mama Solar” Odaba, and her Nairobi NGO, NAREWAMA. Significantly, Ms. Odaba had been one of the trainers in 1995 when Solar Cookers International (SCI) first introduced solar cookers in Kakuma. Before the festival, 50 refugee women were trained to use the cookers, and they in turn trained the children. The festival took place at Hope Primary School in Kakuma Camp Four. During the festival, “Mama Solar” set up fifteen cookers and cooked a wide variety of food, including rice, vegetables chicken, eggs, cabbage, ugali, beans and cake. 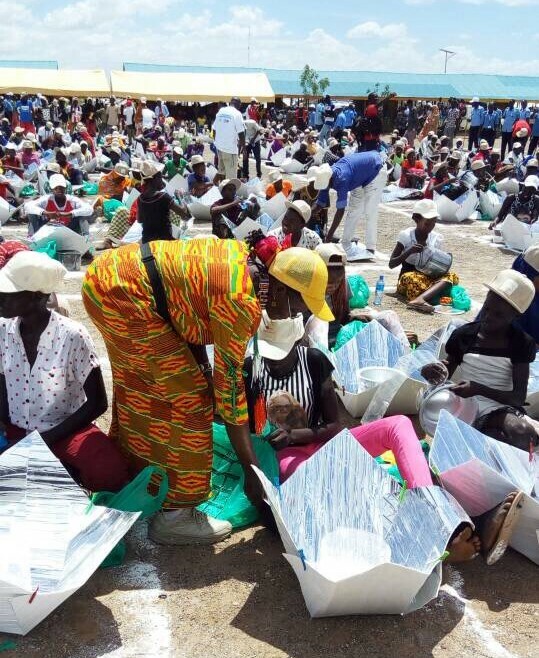 The children sat in neat rows as trainers handed out the cookers, cooking pots, food and water. All the children assembled their own cookers, and successfully cooked delicious noodles before an enthusiastic crowd of family members and relatives. The children were elated and proudly showed off their new cookers. This project was a partnership between Haines Solar Cookers, WFP engineer Godfrey Mawira, the National Council of Churches of Kenya, and Simplified Technologies for Life, which has produced “Suryakumbh” Solar Cooking Festivals for almost 120,000 participants in India, and holds the Guinness Record for the most people solar cooking at the same time: 7,438. Funding was provided by Haines Solar Cookers and the San Diego, California, Rotary Club. Additional support and resources came from Solar Household Energy (SHE). Other partners included Eco-Mandate, which sells solar cookers in Chuka, Kenya, the Alliance for African Assistance, a San Diego-based refugee resettlement organization, and the Rotaract Club of the University of California, San Diego, which made 500 Water Pasteurization Indicators (WAPIs) for the Festival participants. Follow up studies are planned, and Board member Roger Haines is working with Eco-Mandate and a local entrepreneur to offer Haines-Copenhagen solar cookers for sale in Kakuma for a sustainable price of around $25. Your tax-deductible contributions to Solar Household Energy can assist us to maintain the momentum started with the solar cooking festival at the Kakuma refugee camp. For more information, please see the solar cooking wikia entry on Kakuma refugee camp.